The Taming of the Purse! I love to dress up! Purses* or handbags, if you prefer, play a big part in my daily outfits. I change them often. I used to leave the detritus that did not flow into the new bag in the old bag. This was fun when I might find a Benjamin Franklin stuffed in a zippered pocket but, for the most part, I found crumpled tissues, dried-out ballpoint pens and stale Luna bars. Or worse, a receipt that I needed a month earlier or an important business card. So much for networking if you misplace the business card! 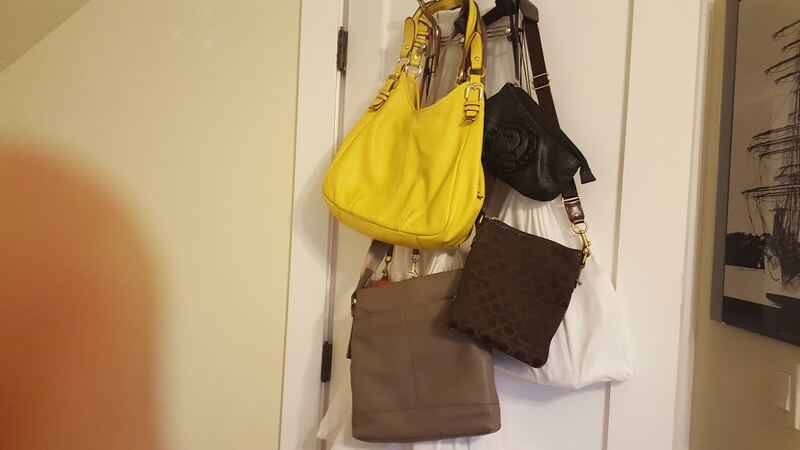 First, I hang all of my purses on the back of a closet door and the back of the door in my home office. The closet door is closed so those bags are hidden. The door into the office is always open, so those bags are not visible either. Small bags go inside bigger bags. White cloth covers protect fabric bags and light colored bags. 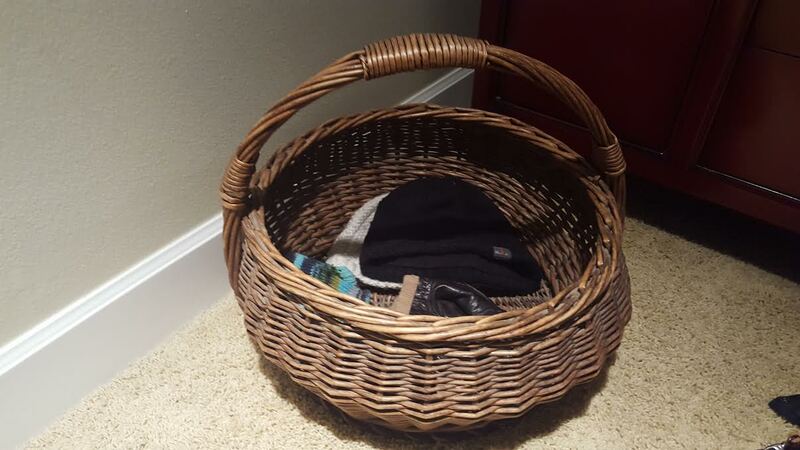 I keep a basket into which I dump the contents of my bag everyday. I toss the old tissue, ticket stubs, etc. When I choose my bag for my next outfit, I simply grab the items that I need from the basket. In bad weather, this might include gloves and a beanie. Sunglasses on a sunny day. You get the picture! Of course, sometimes I have to sort through the basket as it can become the place where many things go to die! Once I empty a bag, I generally shake it out over the trash can in my office to get rid of tiny bits of debris such as lint. Speaking of bags, my current favorite is a small cross body that I use often, especially when shopping or running errands. It may sound weird, but I wear it while dining out and even when I visit the loo so that I don’t leaving it on the hook in the stall. I did that once in a cafe in Denver. Lucky for me, it was still hanging there when I ran back to the bathroom. My niece was not so lucky last summer. In the restaurant, it stays off the dirty floor and no one lifts my wallet. Someone did take my wallet once. What a pain! Whenever I need to carry my IPad, a book, some lunch, I tuck my little bag into my briefcase or a large tote. Even though my cross body bag is small, it holds the essentials. A bonus of carrying a smaller bag, my left shoulder does not get tired as it does when I schlep a large tote all day. There you have it. A simple solution to a problem. Now, what to do about my bag buying addiction! *In this post, I use purse, handbag and bag interchangeably. Posted on February 19, 2016 February 19, 2016 by lorigreerPosted in Blogging 101, Living Everyday, Uncategorized, What WorksTagged girl talk, lifestyle, purses, woman. Next Next post: I’m a Crybaby Today! I am surprised I don’t see more men with bags of various types and applications. Seems practical if you ask me. Men in Europe carry man bags. I guess men in the US are more comfortable with a briefcase or backpack. I agree that it would be very practical for men rather than stuffing everything in their pockets. Thanks for reading and commenting! I enjoy commenting. Sometimes I comment too much. I think it is great to recognize others’ efforts by commenting. Great idea to keep your bags cleaned out! I am also guilty of only transferring the items I need and now I have half a dozen bags with old junk in them. Yes, most women I know leave something in their bags when they switch them. Off to spinning soon. Day 19/30. It would be cool, having lots of purses. But I just have one. And it’s a hand-me-down. I am so weird. I carry only one purse at a time…i hate switching my junk from one to another, so i use ot for a season and then I’m done with it! I like to dress up, too! I like the basket idea. 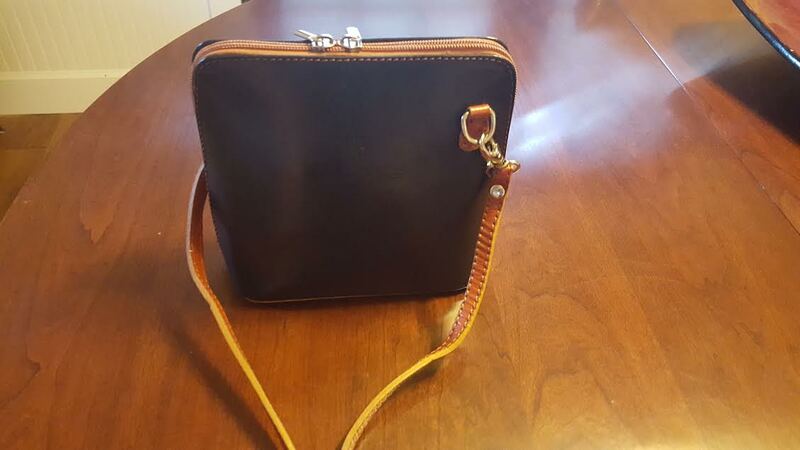 I was watching a Home Shopping Channel many years ago and this young woman patented this interior purse to put things in so it could be taken out of one bag and changed, keeping everything in tact. Ingenious! I have heard of those bags. You’re right…ingenious! Why did we not think of that! Or, post-it notes? Good morning from Portland, Oregon! Or elastics with coverings! I wore a ponytail as a child and those naked elastics hurt! I love purses! You seem to have quite a collection too! It’s weird because when I was younger I hated them but now I love them. I’m bad about leaving stuff in them when I change to another purse. Okay, this is a genius idea. I mean, I’m not really a “purse person” per se. I love the concept of having many handbags, but I fail in execution. Mostly because the idea of having to move stuff from purse to purse is daunting (and I’m lazy, let’s just say it). But that basket thing? I could rock that idea. Plus it also solves the problem of all the crap that always ends up crumpled on the bottom of my current purse! Hooray! Another victory for the little basket in the corner. I hope it makes your day a little easier. My pleasure. Hope it works as well for you as it has for me! Thanks! It keeps me a little more organized and a lot less frantic . Sounds like a GREAT system. I have one like that myself, except for the inexpensive baskets I use have become numerous overflowing containers themselves. Unsure whether 🙂 or 😦 is appropriate here! I recently added my collection of computer bags to the hanging collection as I have several with different capacities. Organization is my goal even though I often fall short. It’s my goal as well…and I’m always looking for ways to improve. Actually, I have along way to go! We live such busy lives that it is hard to be organized…I just try to do the best that I can. Thanks. It was my souvenir from Victoria, BC last summer. The basket is a great idea. An excellent way to make sure you don’t forget what you want to take with you. Alas, all my purses look the same. It’s like the person who has a certain type that they date. I’m kind of like that with my purses. They’re all black and small. I keep looking for that ideal purse that doesn’t bulge but can carry all my essentials, but still look compact. My Mother was a fashion plate. She gave me my love of fashion. I smile often when I wear something I think she would like. Black is always a good choice…I often have a larger bag with me if I am out for the day that I can keep in my car. It has extra shoes, a snack, etc. I love small cross-body bags but fitting everything in is a problem. Have a great weekend. Love this! So simple and practical for those of us who change bags. It’s nice to meet someone else like me with regards to this. I’m starting today! By the way, thanks for visiting my blog and commenting. For the follow, too! I’m enjoying reading yours. Lovely place here! Love this blog/blog post!!! I just uploaded a “what is in my purse” blog post!! Thank you! Your post about your purse was great.